The successful conclusion of a six-part tale, FIRST LORD’S FURY is a brisk battle-epic of magic and military. Feeling very much so like part 2 of PRINCEPS’ FURY, this book is all action and no subtlety. Going from one nonstop battle to the next, this was a breathtaking feat of furious pacing. When there is a moment of rest, it’s clear to everyone that it’s merely an interlude between battles. I can’t really say anything without spoiling the entire plot… so, yeah. I liked it. But this story wasn’t self contained at all- this book is very much so the climax of each and every plotline and character arc which occurred in each of the prior five books. This book loses a lot (maybe all) of it’s meaning if you haven’t read the previous books. I’m going to treat the rest of this book as as a review of the entire series. The characters are strong. They use established tropes, but their characterization is always intelligent and consistent, but each character has a graceful arc of change from one book to the next. I would have liked more character change in each book as well as between books, but no author is perfect. Tavi starts the series as a little shepherd boy but winds up being king of the world, which is a dramatic and unbelievable change. However Butcher makes this extreme character development believable. I will add that Butcher (and the brilliant narration of Kate Reading) somehow made me feel bad for the Vord Queen, as the Queen comes to terms with her defectiveness and the fact that her two ‘parents’ do not love her. The plots are usually fairly strong, if repetitive. All of the books had a sub-plot or main plot about monsters invading (book1: Maraat invading, book2:zerg/wolfs invading, book 3: civil war/wolfs invading, book4: civil war/wolfs invading, book5:zerg invading/yeti invading, book6: zerg invading). 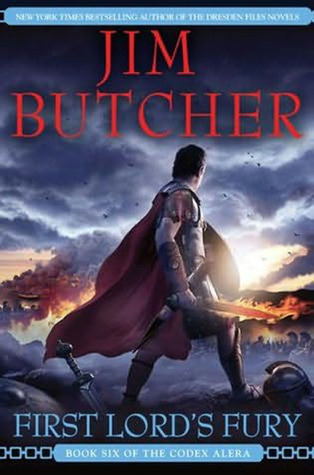 I would have liked if Butcher used more inter-human plots and didn’t rely on aliens attacking so much because the civil-war bits were the best bits. The fighting/military combat scenes were universally strong. I really liked how physical he made the action seem. In particular his innovative use of his magic, basically using logic and science to turn primal magic into deadly weapons, was entertaining to read. The pacing for the books was fantastic, if a touch too fast paced occasionally. The author really should have spent more time devoted to slower character-focused moments. Okay, constructive criticism for the series as a whole. The setting is fun… if a bit skin deep. The book is Roman influenced, but the author didn’t include much more Rome than Legions, Senates, Centurions and camp organization. The author could easily have swapped these superficial aspects out with ancient Japan or Aztec Mexico and it would have felt the same- the Roman part was superficial. I wanted votes for Dictator, a fluid class structure and for the slavery issue to be handled more true to the time period (there was no abolition movement in ancient Rome). I’m big into using as much history accuracy as possible in historical fantasy, so I’m picky. The non-human sapients were also kinda monotone; e.g. all the wolf-men are savage and only respect strength. I would have liked if the author made his monsters more nuanced and varied. For example all the Canim were warlike and bloodthirsty (even the nice ones), all the Maraat were nature loving hippies(even the nasty ones) and all the Vord Queens were devoted to the idea of consuming the world. This shallowness makes me think their cultures were skin deep. Highly recommended. Start with book 1, FURIES OF CALDERON, and move on from there. After reading this, I wish Butcher pulls a Mistborn and has a subsequent series set in the same world but in a far-future timepoint. I want to see how this civilization develops after the transformational event of the Vord invasion.